Description: Gardeners find this species somewhat controversial, black being a colour that has an association with death for some, while others delight in the thick purplish-black velvety fur that so heavily tips the white or occasionally in some variants, pale pink bracts. These slim flower heads, superficially similar to P. neriifolia in shape, are borne over a long period from late winter to early summer and are sometimes used for picking purposes, although the bush is more often grown as a curiosity by collectors. P. lepidocarpodendron is a fast-growing, dense bush to 2.5 m high (or even 3 m under ideal conditions) and can spread to a width of 2 m+. 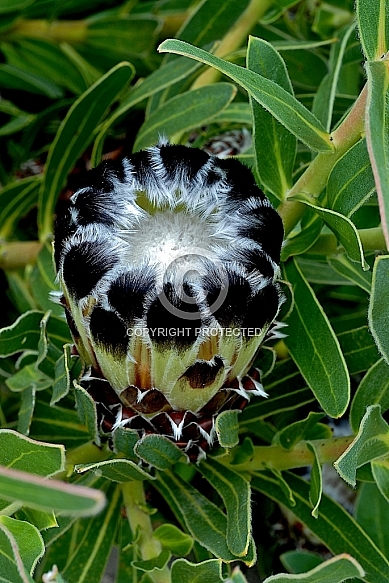 A good coastal subject, the black protea will usually withstand salt winds well, but it will not usually survive frosts much below -1 or -2 ℃. It prefers reasonably moist, humid conditions in temperate climates. Attempting to grow it in hot, dry climates will usually lead to disappointment. As with most proteaceous plants, well-drained soils are a pre-requisite to success.